I seek equilibrium in all my creative endeavors. Equilibrium is not a static or unchanging state. At any point in time, multiple opposing and coherent forces are at play, yet equally balanced. I aim to evoke this same sense of balance in both my photography and millinery through the thoughtful use of compositional elements, light, and lines. My photography emphasizes the drama and beauty of inspiring places. Vast landscapes and microscopic worlds, seemingly worlds apart, co-exist in a place where humans feel insignificant. I am drawn to texture, symmetry, and repetition in nature. I search for compositions that highlight the rhythm and balance in this seemingly chaotic world. I am also a costumer and performer and discovered millinery, the art of making hats, through those passions. I work with many different millinery materials such as felt, straw, silk, and bamboo. I also make my embellishments such as silk flowers and fake feathers from woven straw. My hats are entirely handmade, from shaping the materials on wooden forms to stitching and finishing the hat. I place a strong emphasis on detail and high quality construction. All of my hats are one-of-a-kind wearable sculptures for the head. My designs range from vintage-inspired hats with traditional crowns and brims to abstract shapes achieved through hand manipulation of materials. I am inspired by the art deco era and Hollywood glamour. I am also a photographer, so I apply elements of photographic composition to my hat designs. In particular, I seek asymmetry; strong, elegant lines; and balance in color value and hue. Natalia Melcer is a milliner and photographer living in Washington, DC. Natalia began her exploration of photography in 2009 with an introductory photo-editing class followed by a trip to the Galapagos Islands. Since then, she has combined her love for travel and nature to visit and photograph some of the most inspiring places in the world. Natalia is passionate about capturing stunning landscapes and intimate portraits of wildlife. She also experiments with macro photography of the natural world and occasionally photographs weddings and live performances. Looking to expand her costuming skills, Natalia took her first millinery class in 2010. Since then, she has taken classes from many instructors all over the east coast and in France in the summer of 2013. 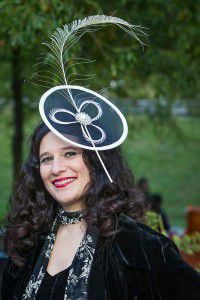 She dedicated herself to advancing her millinery business in 2012 and is excited to bring new hats into the lives of friends, family, and clients!